It’s not fair to play favorites. 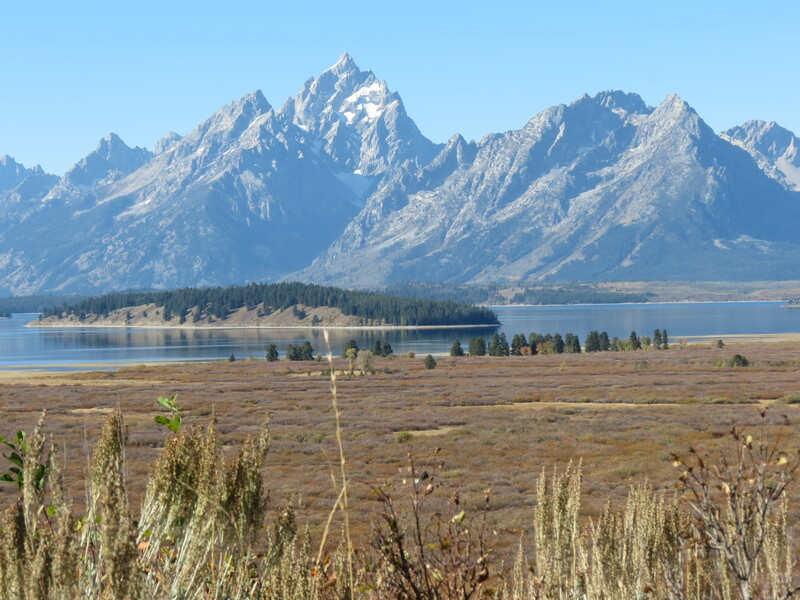 But I have to say that the Grand Tetons topped Yellowstone this time around. However, it wasn’t a level playing field. While we were enamored with Yellowstone’s rich offerings, we were constantly on the go, traveling from place to place in order to see it all. We walked miles of boardwalks built to protect nature’s attractions and accommodate the large volume of visitors. We followed signs to scenic overlooks and followed well-worn paths. Throughout it all, we attempted to curtail our activities so as not to worsen Rich’s ill health. But we failed. His misery deepened as he spiraled down with pneumonia. Clearly our experience was tainted. I stopped myself short of buying a coffee mug, my favorite souvenir, emblazoned with a bear and the words Yellowstone National Park. I couldn’t bring myself to burden Rich with bad karma each time he opened the cupboard. In contrast, the Grand Tetons offered a respite. 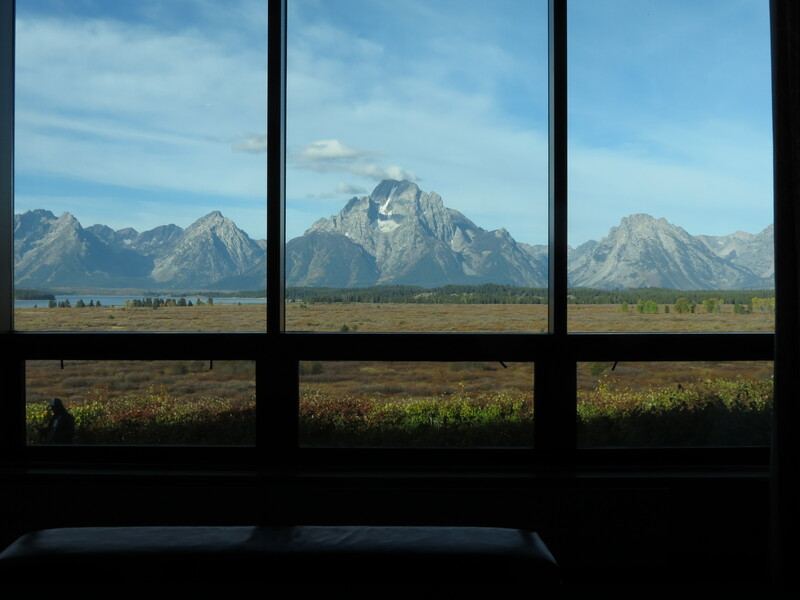 Through sheer luck, we secured four nights in Jackson Lake Lodge. The grand lobby with soaring windows overlooking the rocky mountain peaks and Jackson Lake offered daylong access to cushy couches and chairs for relaxing and absorbing the view. A coffee bar, restaurants and a bar/lounge were within mere steps. Knowing Rich’s condition, the staff ensured that our room was just a short distance away. It felt like a haven in the wilderness. But the real benefit was the nature of the park. 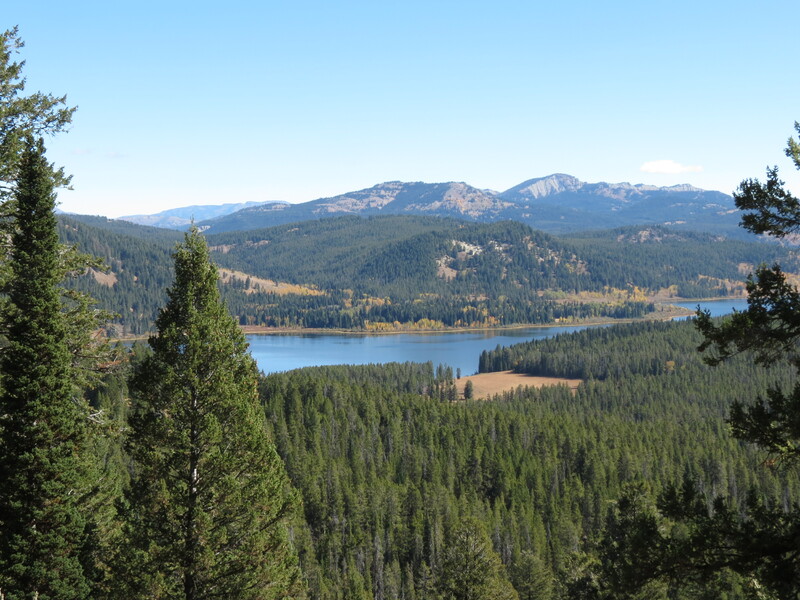 The mountains, the lakes and the wildlife were the draw. The natural beauty to behold. There were no must-do sights compelling a visit. We could do as little (Rich) or as much (Molly) as we pleased. We had a central base from which we could explore, either together or separately. Hiking alone is a consideration in bear country, so I limited myself to safer routes – still accompanied by bear spray. 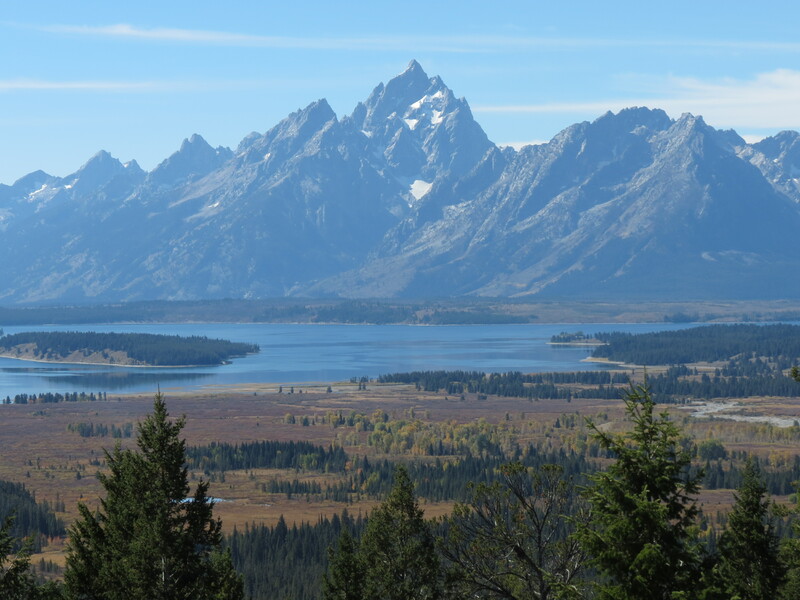 Taking the trail to Grand View Point afforded me views in two directions, out over Jackson Lake and the Tetons and overlooking Two Ocean Lake with forested crests on the other side. Naturally, Rich ventured out in search of birds and wildlife. 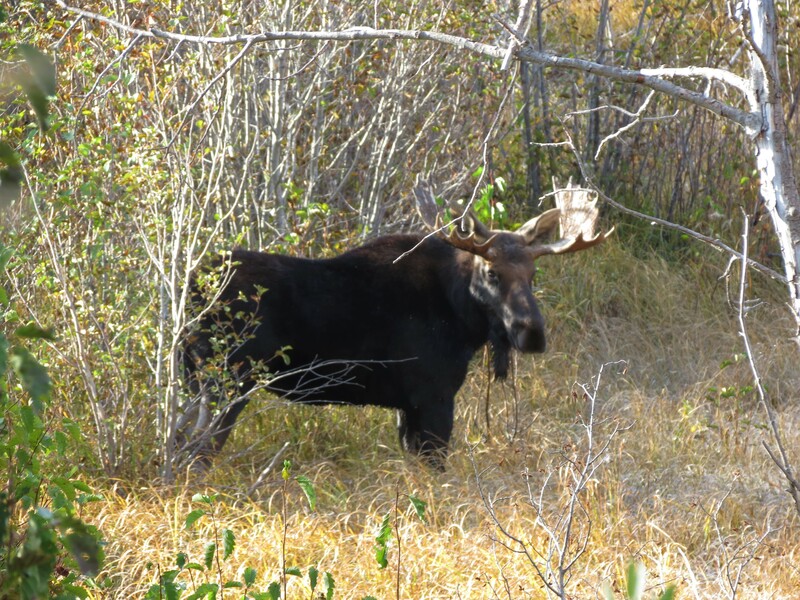 I accompanied him to the Willow-Moose Road, where we found a pair of moose. We watched the bull for close to an hour, as he kept tabs on his cow moose. He was an expert at camouflaging himself behind bushes or branches that obscured our view, but we persevered and enjoyed the show. Oxbow Bend was another favorite, just a couple miles down the road from the lodge. 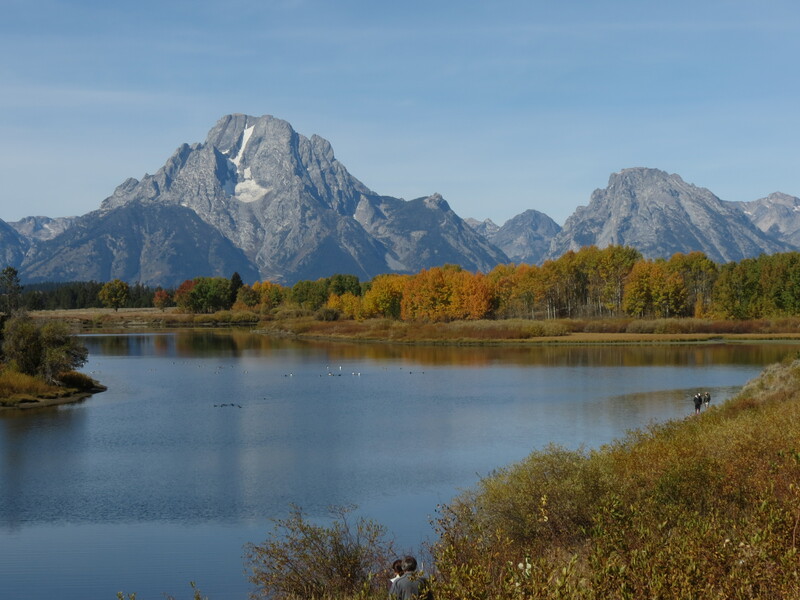 Fall colors were in full display against the backdrop of the Tetons, and it held the promise of bird and wildlife viewing. 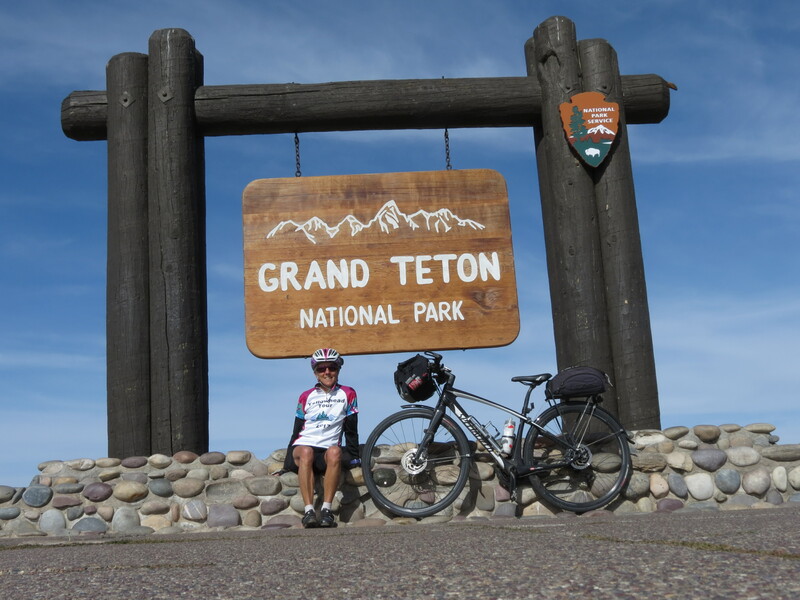 We found the Grand Tetons to be far more bicycle friendly than Yellowstone. The 20-mile long multi-use paved trail attracted my attention. I had my heart set on cycling it the full distance from Jenny Lake to Jackson and back again. Although it parallels the highway, I relished the safety of the path and the constant companionship of the mountains that flanked the route. I even experienced a cycling wildlife jam, when motorists stopped and flooded the path to photograph a herd of elk at close range. 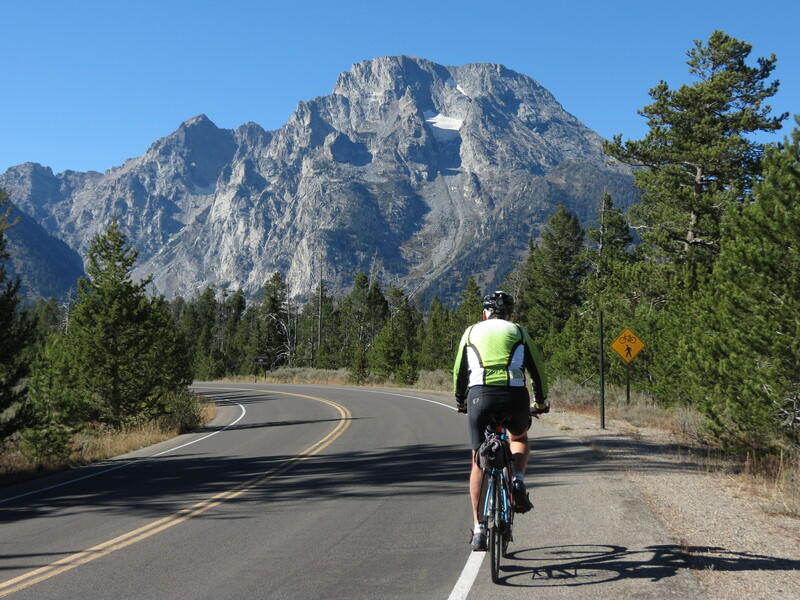 Rich tested his mettle on the Jenny Lake Scenic Drive, a short one-way road with a bicycle lane. 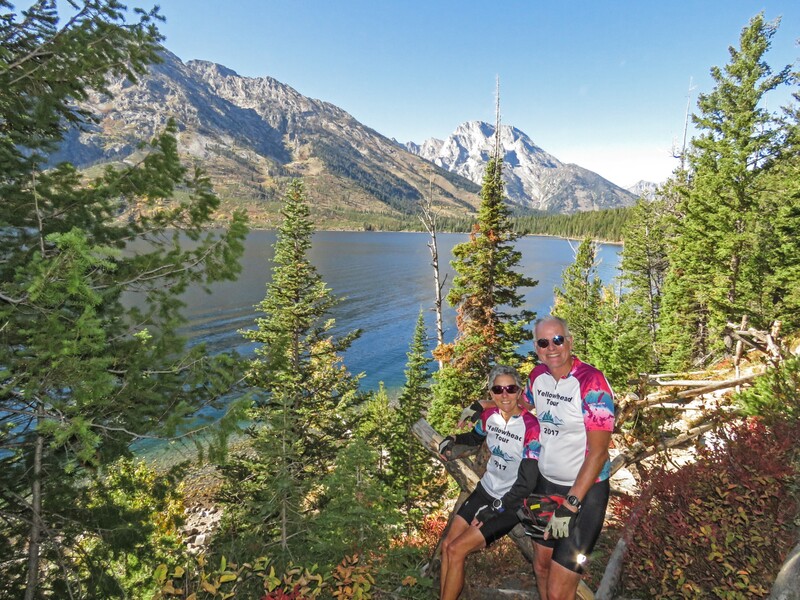 We cycled up and back, marveling at the blue-green waters of Jenny Lake. The sun dappled route on a warm afternoon was good medicine for both of us. Some of the park roads had good wide shoulders, allowing us to cycle right from the lodge. 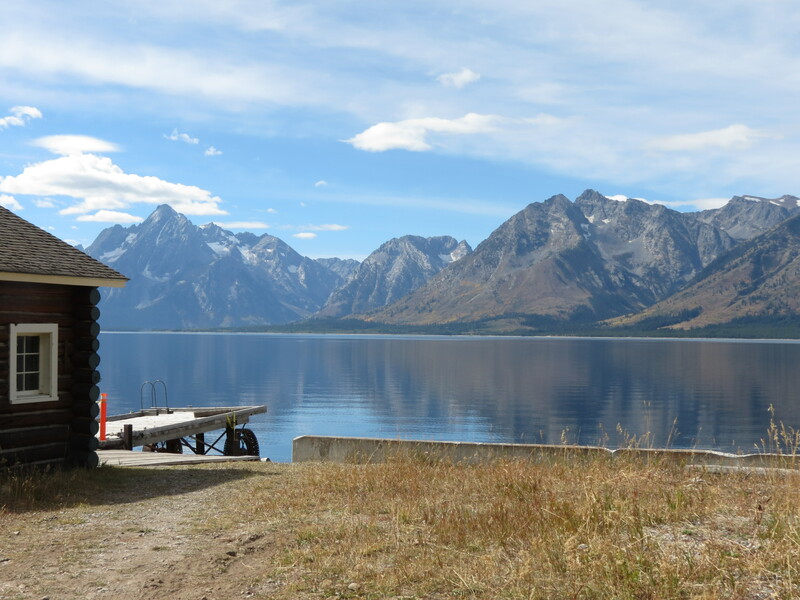 A trip to the Colter Bay picnic area brought us right down to the lake and a rock beach. I ventured a little further to reach the National Park Service and University of Wyoming Research Station, a peaceful perch on the lake. 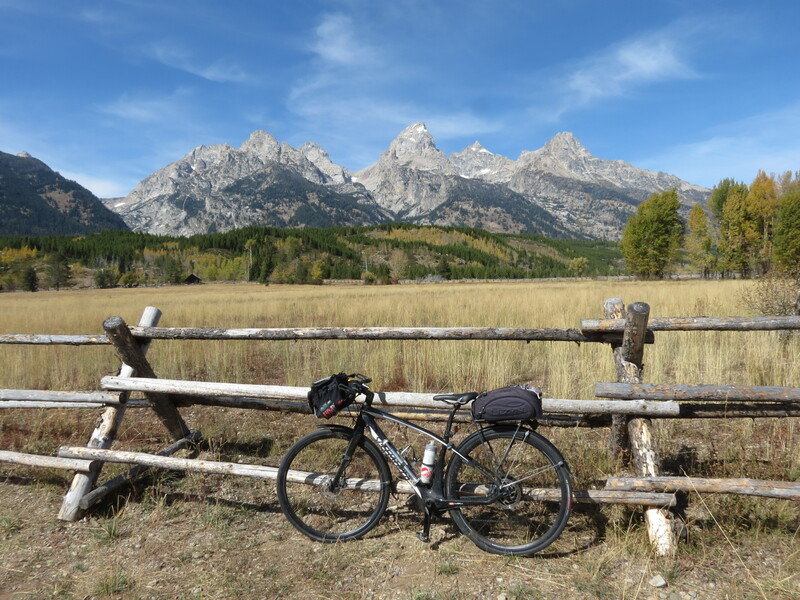 The Tetons afforded us a more relaxed pace and the ability to make plans at will. And a chance for Rich to recuperate. Even just hovering around the lodge environs was a treat. It’s not often we splurged like this. It was worth savoring. And I bought my souvenir mug. It says Grand Tetons National Park and has a moose on it.